involving unsheltered individuals meaningfully in the evaluation of the Navigation Team. While the titles of the reports emphasize the Navigation Team, the review is much broader, taking a look at HSD’s approach to these areas beyond simply what the Navigation Team does itself. And it finds the response lacking. Let’s take this one area at a time. 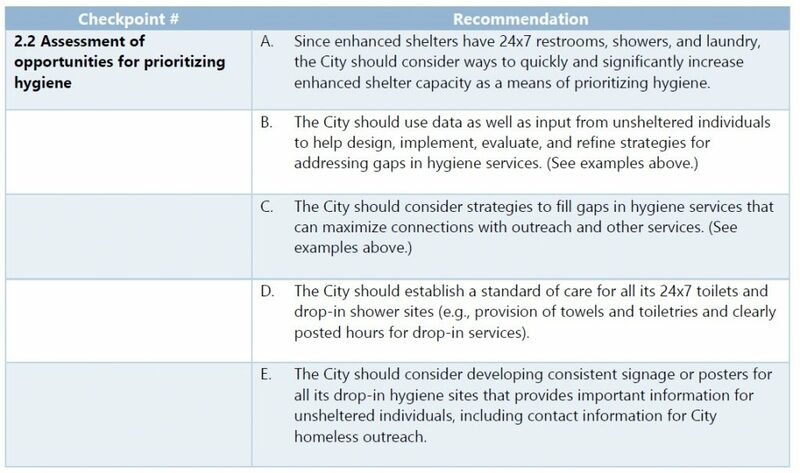 The City does not currently use a robust systematic approach for managing homeless outreach field operations, which involve nine nonprofit organizations, multiple City agencies, and King County. Without such an approach, the City cannot ensure outreach work is well-coordinated and effective. We encourage the City to consider reinstating some of the strategic coordination components from the Federal Emergency Management Agency’s (FEMA, Incident Command System (ICS)). In the early days of the Navigation Team, this is exactly what the city did: it deactivated its Emergency Operations Center (which uses FEMA’s ICS) and brought all the stakeholders together every morning to coordinate activities. 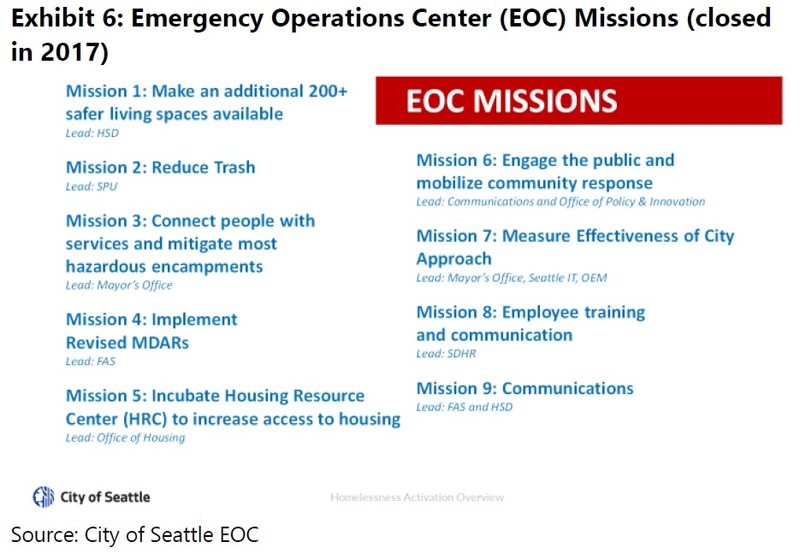 But in late 2017, it closed the nine “missions” associated with the EOC activation, and decentralized control over the homeless response. 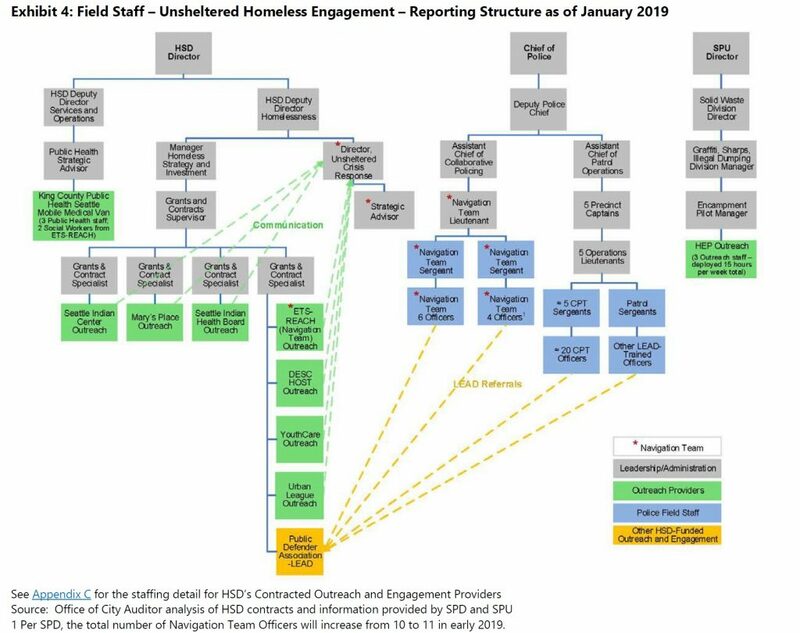 The city acknowledged in its Q2 report that outreach to the newly-unsheltered is a “gap,” but that’s a far cry from the systemic problems that the auditor found. The auditor also notes that late last year the amazing local organization Mary’s Place, one of the organizations under contract with the city, has set up its own outreach portal and dispatches outreach teams to families that contact it directly. This isn’t the first time that Mary’s Place has stopped waiting for the city to get its act together; it launched its own housing resource center rather than continue to wait for the “landlord liaison” program to reinvent itself into something useful. There are multiple ways HSD is making strategic plans to include the voices of those who have experienced or are currently experiencing homelessness in program planning and evaluations. 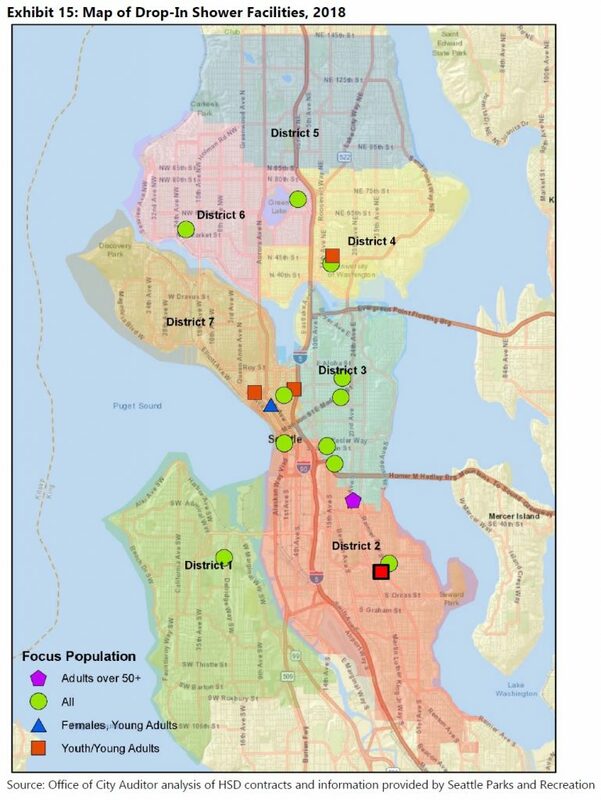 This plan includes the ability to do outreach and engagement with the unsheltered population for, not only the Navigation Team work but also the broader homeless system, programming and evaluation. Currently HSD is working with a contracted trainer to learn how to use techniques such as focus groups, surveys, and key informant interviews to use in supporting programming and evaluation. A focus in using these skills to engage with the unsheltered population with conversations about homelessness systems include the Navigation Team work and learnings can be directly applicable. Crosscut recently reported on a local poll showing that voters are unhappy with their city leaders for their lack of progress on issues such as addressing homelessness — and they often don’t believe that lack of funding is the problem. 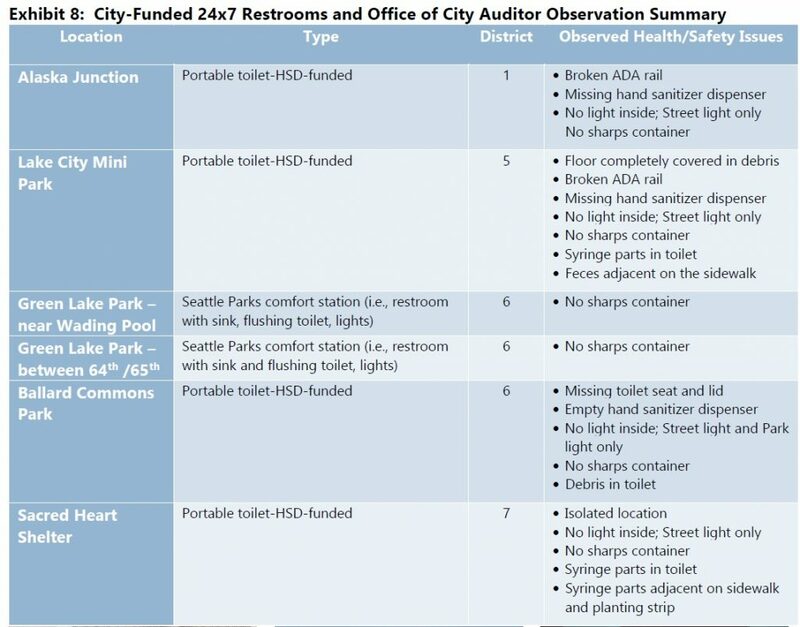 Today’s report from the City Auditor will certainly bolster that view, for better or worse, providing substantial evidence that the city is not executing well on the substantial resources it currently has to address homelessness. And there is plenty of blame to spread around: former Mayor Ed Murray and former HSD Director Catherine Lester, who established the Navigation Team but left accountability and evaluation as an afterthought; current Mayor Jenny Durkan, now 14 months into her tenure, who has failed to make meaningful changes that would address the failures the City Auditor points to; and interim HSD Director Jason Johnson, who previously served as Deputy Director under Lester and had as much of a role in creating the current system, flaws and all, as any of the other city leaders. Johnson is now Durkan’s nomination for permanent HSD Director, though it’s unclear why he would want the job at this point given the attacks that Council member Sawant, some HSD employees, and representatives of some human-service providers under contract with the city have hurled at him since he was nominated by Durkan. On the flip side, the auditor’s report equally raises valid questions as to whether Johnson should have the job in the first place. The City Council has some responsibility for this debacle as well. On one hand, it’s to be credited (led by Council member Herbold) for requiring HSD to write the quarterly reports and for requesting the City Auditor to fact-check them. 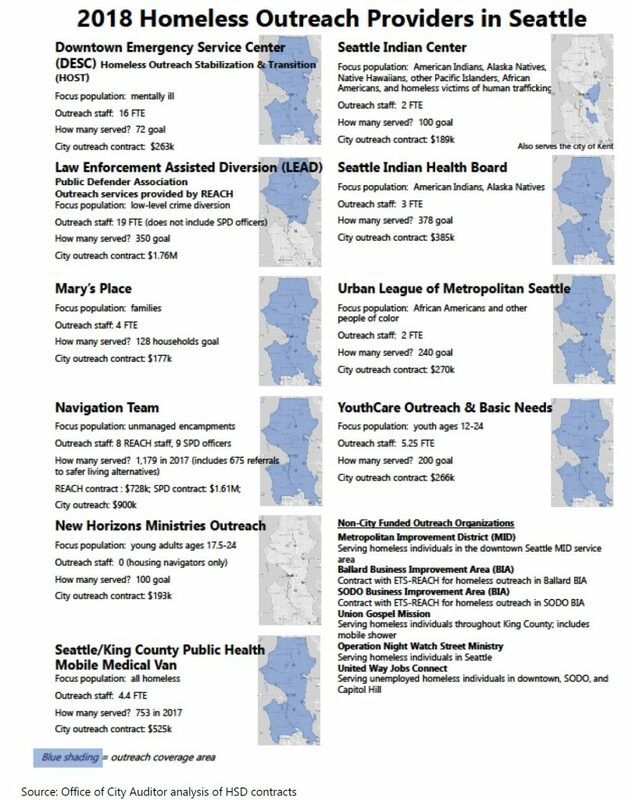 On the other hand, the Council (led by Council member Sawant) has repeatedly undermined accountability measures by inserting into the budget funding for specific providers (most notably SHARE/WHEEL) that they have a close relationship with, after HSD rejected their bids because of poor performance. 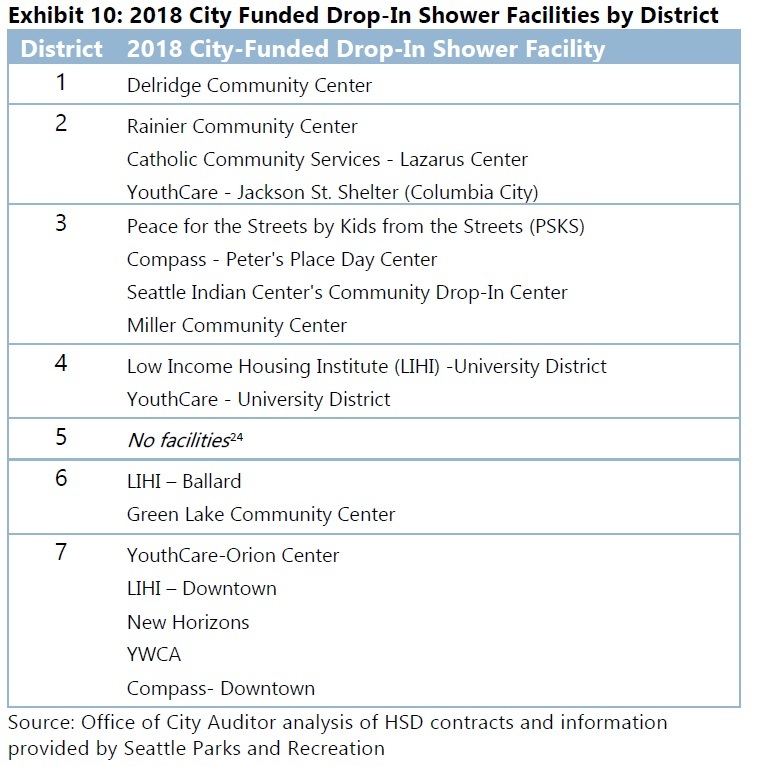 Granted, the Council re-inserted funding for hygiene services after HSD shifted it over to enhanced shelters; however, the Council directed it toward daytime and evening hygiene services, mostly downtown — not overnight, and not in the underserved parts of the city. Strangely enough, the auditor’s report doesn’t provide much guidance in answering one question that is top-of-mind for many: whether the Navigation Team itself is living up to its billing. Perhaps one day, when many of the conflated issues have been resolved, we’ll get some clarity on that question. Thanks for your synopsis. Helps when one dives into the whole report. 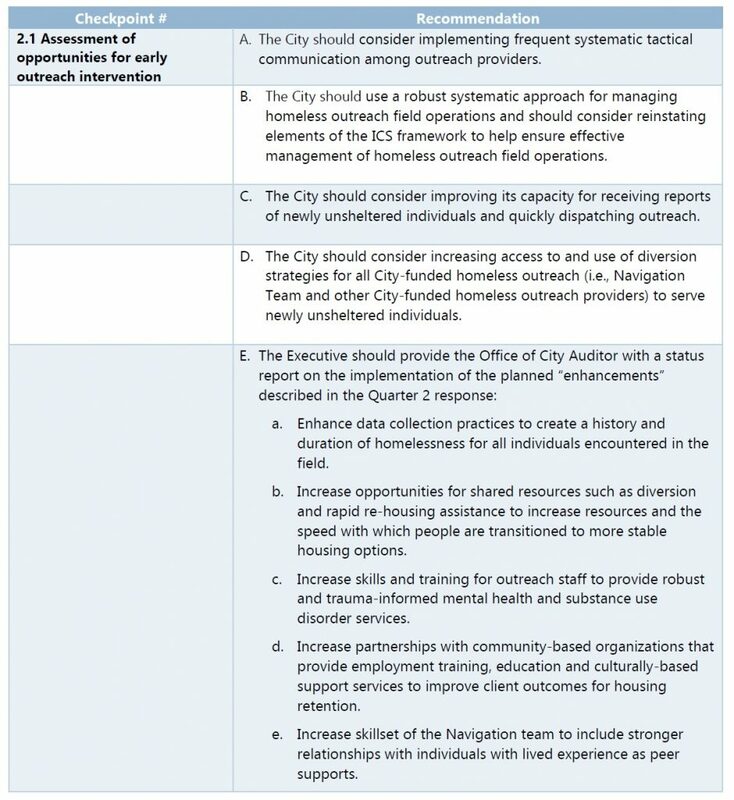 Question – From the chart on page 9 of the report – Is the DESC run HOST program the Navigation center that was opened up a couple of years ago or is it a street outreach program? It isn’t the Navigation Center. I believe it’s the outreach workers that are integrated into the Navigation Team. Thanks. I think you are right. Sometimes it’s hard to figure out exactly what the many programs are focused on. apparently the city has the same issue.